Where have you been all my life you adorable, heavy-duty, Stoneware TV Dinner Tray? Seriously. I love you. TV Dinners are a memorable part of my childhood. Not because we ate them all that much. But because I wanted to! Each food neatly contained in its own compartment. Come on, how perfect is that? Especially when you're a kid. And, without fail, you could count on dessert. Again. Important. 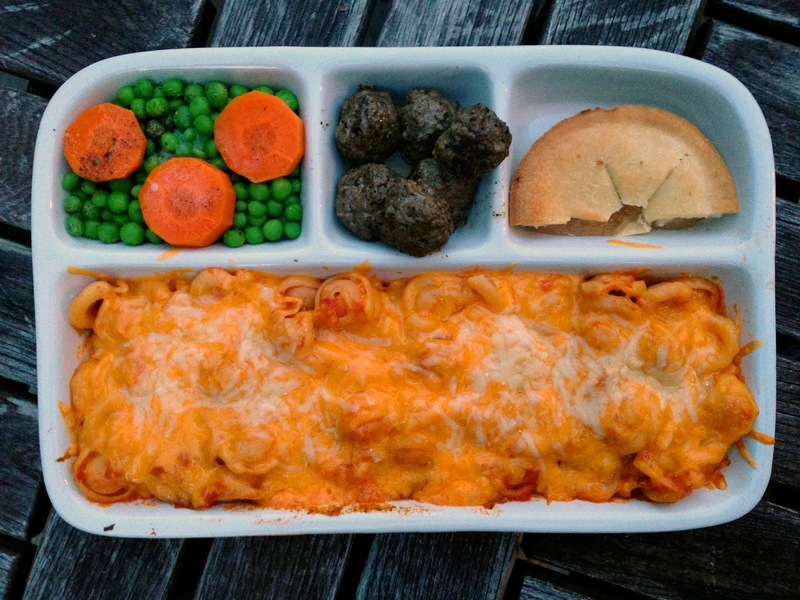 But I understand that the legendary TV Dinner is not necessarily in a 10 year old's lexicon today. Tonight I said, "I'm going to make you a homemade TV Dinner!" to Spud. I was pretty excited. He promptly cocked his head and said, "A what? A TB Dinner?". Turns out he had no idea what I was talking about. Let's just call that a good thing, shall we? As I remember, while they were cool, they lacked nutritionally speaking. He's a convert now though. And I'm so excited that I'm able to introduce the idea to him with "real food" ... um ... for the most part. So what was in Spud's TV dinner? Peas and carrots. Of course! With a pat of butter that melted in the oven. Baked pasta with a browned cheesy top. Elk meatballs. You weren't expecting that, were you? And half a mini apple pie, which, just to be clear, we did not make, we bought. The diehards will note that the dessert was not in the centre compartment in the top row ... I had a hard time with that too. I'm over it now. I expect you will be soon too. Did he eat it in front of the TV? Why, yes he did. Note to self: find a nice set of TV tables. Want a pair of these dishes for yourself? I found them at Uncommon Goods where I also found approximately a million other unique, fun items to covet. Check it out. DISCLOSURE: I sometimes get a freebie when I review a product or a service but I'm here to tell you that I will not enter into any agreement with a company that I do not believe in. To be clear, I don't gush about things that are not gushable. Just so you know.